Here is a quote from the most recent report by the Denver Metro Association of Realtors that I found fascinating about the Denver real estate market. “Despite what feels like a major market shift, home sellers in Metro Denver are still in control in all housing price ranges, except homes priced over $1 million where homebuyers and sellers are on equal footing.” In my opinion, only time will tell and a good forecast for 2019 may be February and early spring home sales momentum. 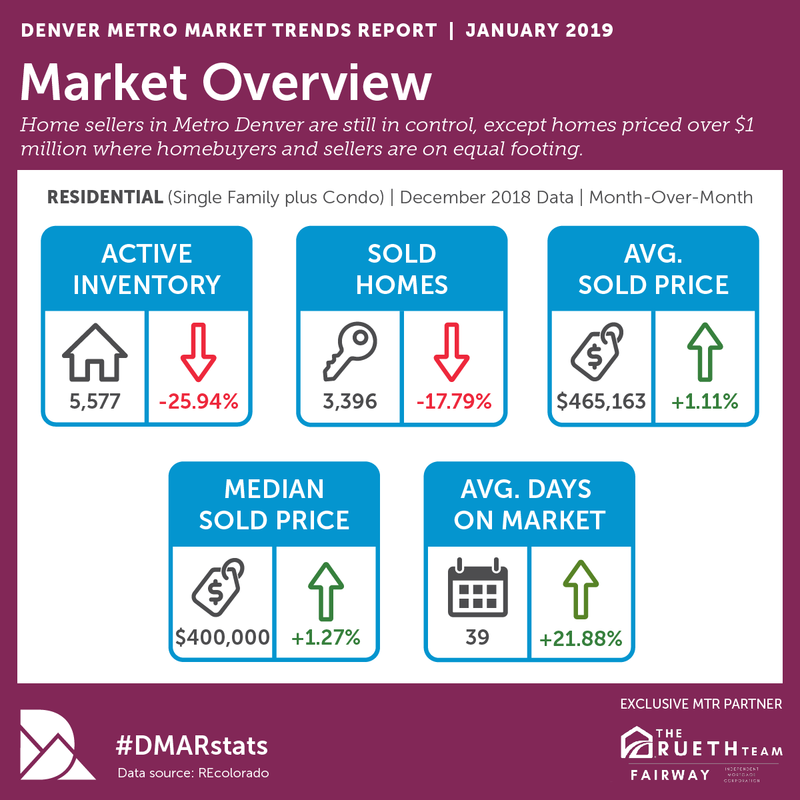 Macroeconomic factors and rising rates are just a couple of other factors that may have an impact on the Denver metro market. 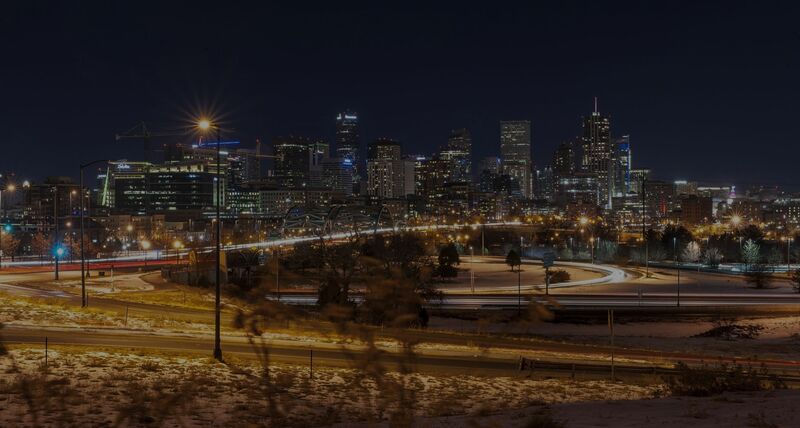 In this article, we will discuss and distill the Denver Metro Association of Realtors (DMAR) recent report with data on Denver and metro area housing for 2018 and last month. A single-family house in Denver has an average price tag of $522,839, which climbed up 8.05 percent in 2018. Condos on average were $351,677, or a 9.82 percent increase. According to the report, there are a couple of factors continuing to drive the market: 1) 80,000 people moved to Colorado in mid-2017 to mid-2018 (US Census Bureau), and 2) millennials are coming off the sidelines to purchase their first home. The luxury real estate market remained strong in 2018. There were 2,156 homes sold for $1 million or more. Compared to 2017, the luxury market crushed it climbing 18.1 percent compared to last year and sales volume rose to $3.29 billion. The luxury single-family market homes over $1 million included 3,982 listings, which catapulted up 39.4 percent compared to last year. The luxury condo market had 1,685 listings at the end of the year, which is up an astounding 58.66 percent. As far as the Denver luxury market as a whole goes, the average price inched slightly lower to $1,525,441. 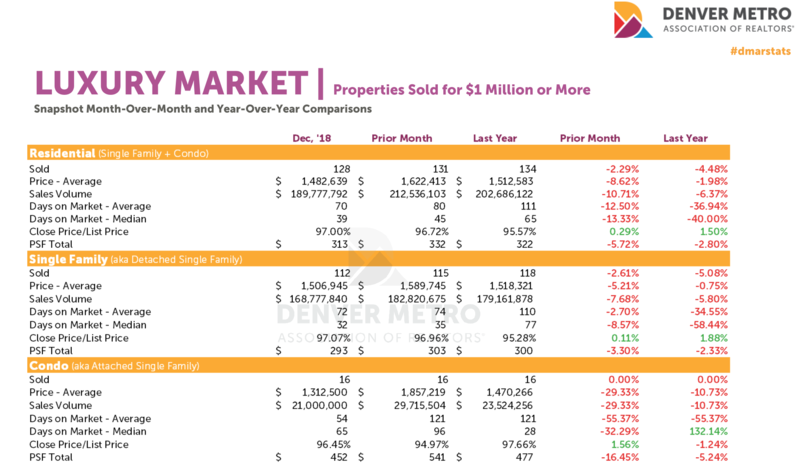 Below is data for the luxury market in Denver from DMAR. A notable luxury sale in Cherry Hills Village claimed the prize for the highest priced single-family home sale last year coming in at a measly $6,800,000. The luxury condo that took honors sold for $1.68 million, which had 3,117 square feet, 3-bedrooms, and 4 bathrooms. A few other notable stats about the luxury single-family market were: 112 luxury homes sold, average days on market was 72, and the “close-price to list-price” inched up just shy of 2 percent. The luxury condo market had 16 unit sales, which is the same as last year. But, the average days on market for a luxury condo plunged 55 percent in December to 54 days compared to last year. The “close-price to list-price ratio” was a little over one percent decline. The report closed with the fact that they think “move up buyers are on the rise.” One of the driving factors they noted was that Denver homeowners are sitting on equity in their homes, so they are looking at moving up to a larger home or a newer home. In my opinion, February will be a solid indicator for what the 2019 real estate market will look like in Denver. Click here to connect or learn more.